I got this Monstera from the UWS Sill location a few weeks ago. I initially had it in my room near a north facing window, but then I read that north facing windows provide the lowest light. I moved in right next to my unobstructed west facing living window after about a week or so. I may have overwatered it at some point, I think I was watering the recommended 1x/week but I might not have waited until the soil was dry enough. I've since been really cautious about watering. Several leaves are wilting a lot and one small leaf is very yellow. I noticed another larger leaf (not shown well in this photo) is getting a yellow around one edge. 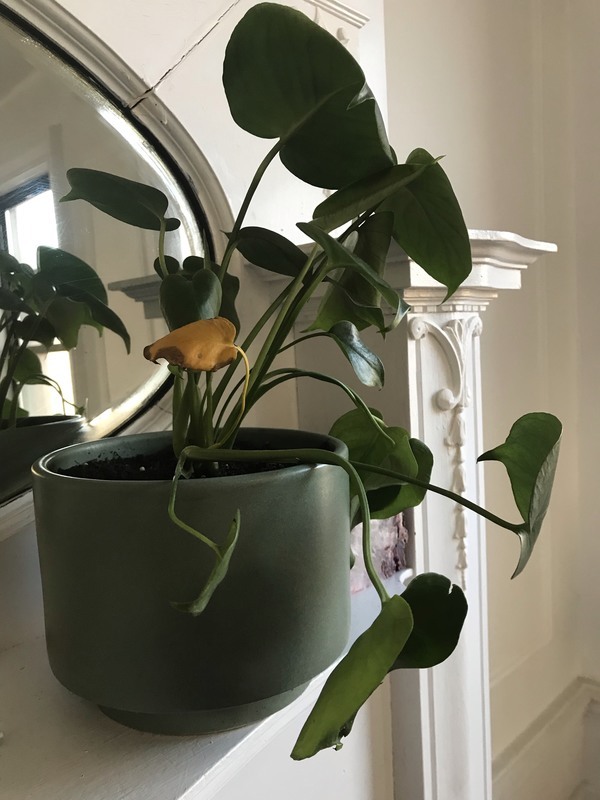 I'm confused because the information card the Sill gave me about Monstera plants said that wilting is a sign of under watering while yellow leaves are a sign of over watering - but I have leaves that are in both categories so I'm not sure what's going on. Any thoughts and comments would be much appreciated! Really hoping I can improve this plant's situation! Eliza Blank Selena, I recommend you cut out the yellow leaves and situate the Monstera in direct light (so long as it's warm... ie not touching a cold or drafty window) and really let it dry out. It should make a full recovery! You can also clip out that one "loose" stem. The plant will put all its energy into the healthy leaves and new leaves soon too! Selena S Thank you so much for your reply! So I ended up coming across a propagation video for the Monstera and realized that the two stems that were wilting a lot and had the yellow leave did not have strong enough roots. I pulled soo lightly and both came out extremely easily. I ended up just removing them and the remaining stems appear to be stronger. I'm a little bummed because I'm not sure the Sill potted those stems correctly or if I didn't care for them well initially; however, the rest of the plant seems very healthy and is growing new leaves!